One of my favorite artifacts in the lab is a falcon mummy, which I described in an earlier post. 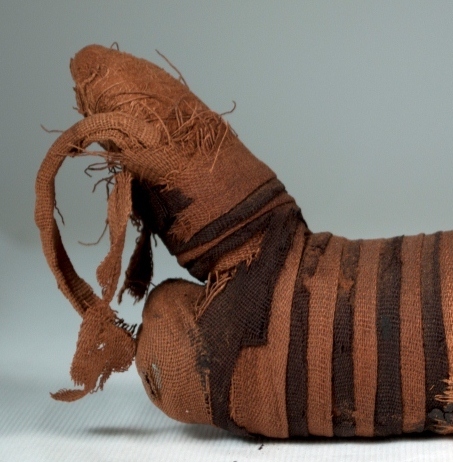 While he is a fascinating object, this poor little guy hasn’t been able to be exhibited, or even handled very much, because some of his linen wrappings are quite deteriorated, brittle, and breaking apart, causing serious structural issues. Recently, I worked to stabilize the linen wrappings on his feet, which were partially detached, and in some areas, barely hanging on by a few threads. Before carrying out any treatment, I did a little bit of research and carried out some testing to determine what materials I might want to use to repair the textile. I knew that a stitched repair would not be possible, as the linen fibers are far too weak and this would likely cause further damage, so I started investigating different adhesives and support materials to use instead. As part of this process, I consulted with Nancy Love, a local conservator in private practice who specializes in textiles. Nancy recently visited me in the Artifact Lab, and among the other materials I was trying, she suggested that I experiment with nylon bobbinett, a heatset nylon net. I did some experimentation with it, and I really liked how it behaves, both as a support fabric and as an overlay to protect fragile areas-it drapes well and can be toned easily with dyes or paint. After feeling satisfied with the results of some of my tests, I set out to repair the damaged linen over the falcon’s feet. I started by toning the bobbinett with Golden acrylic paint. Then I backed the fabric that was dangling off the back of the foot with the toned bobbinett lightly coated with 10% methylcellulose in water. I then used the bobbinett support fabric to raise the partially detached fabric up into place, secured temporarily with pins. After positioning the linen, I covered the entire back of the foot area with another piece of toned nylon bobbinett. Finally, I tacked down the strip of linen over the top of the feet, which was also partially detached but otherwise fairly stable, using small beads of methylcellulose. Reattaching the linen over this area also hid the edge of the nylon bobbinett overlay. I’m pleased with the results, and I can now breathe a sigh of relief that we’re not going to lose any more of the linen from this area. My next task will be to address the falcon’s partially detached head/neck area. Hang in there, little guy! 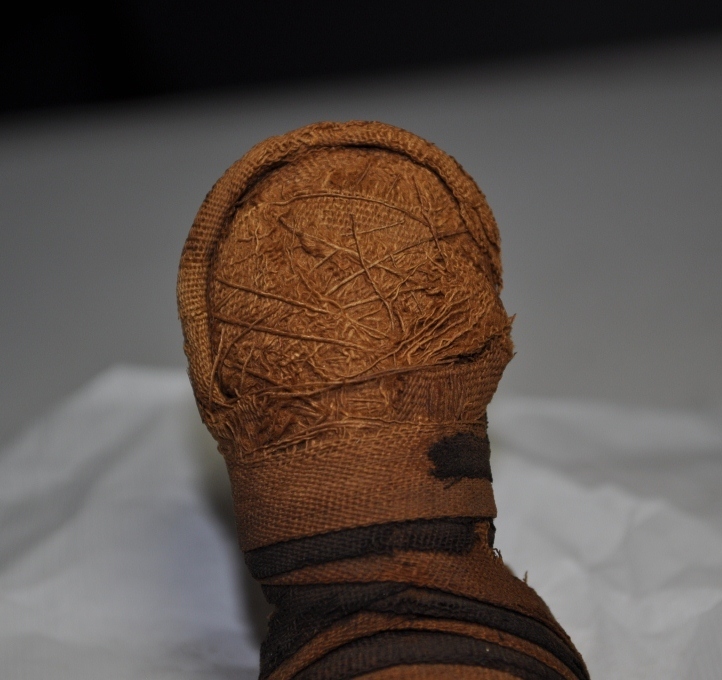 This entry was posted in Animal Mummies, conservation treatment, Objects In the Artifact Lab and tagged falcon, linen, methylcellulose, nylon bobbinett by mollygleeson. Bookmark the permalink. Nicely done Scott, and great photos of the work! Way to go Molly! Two UCLA/Getty students have recently been involved in creating similar overlays on fragile textiles. By the way, I like how your falcon mummy has a “heel” and a “toe”!! Thanks Ellen 🙂 This was definitely a rewarding treatment. And I just finished it completely-I’ll get a post up soon about the rest of the work! completely-I’ll get a post up soon about the rest of the work! Really enjoying your posts! It is very interesting to see how you work to preserve such fragile linen! Thanks Cyndy! 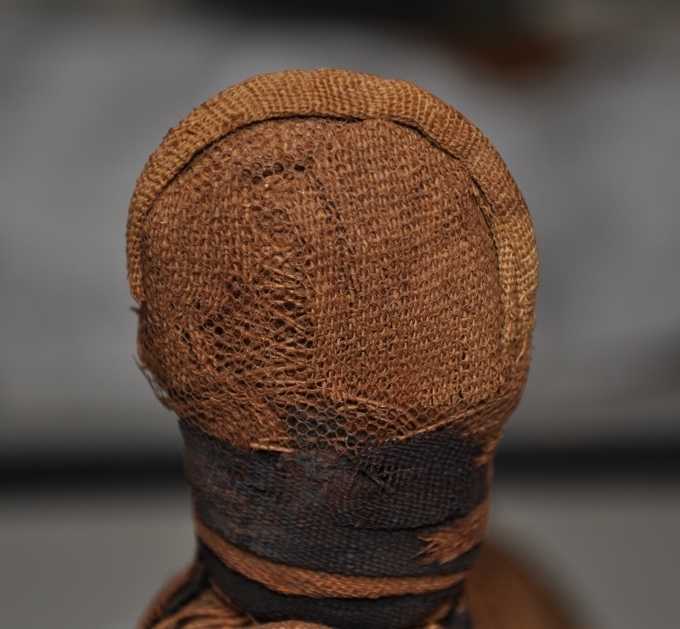 I will be posting another one soon about how I completed the falcon mummy treatment. 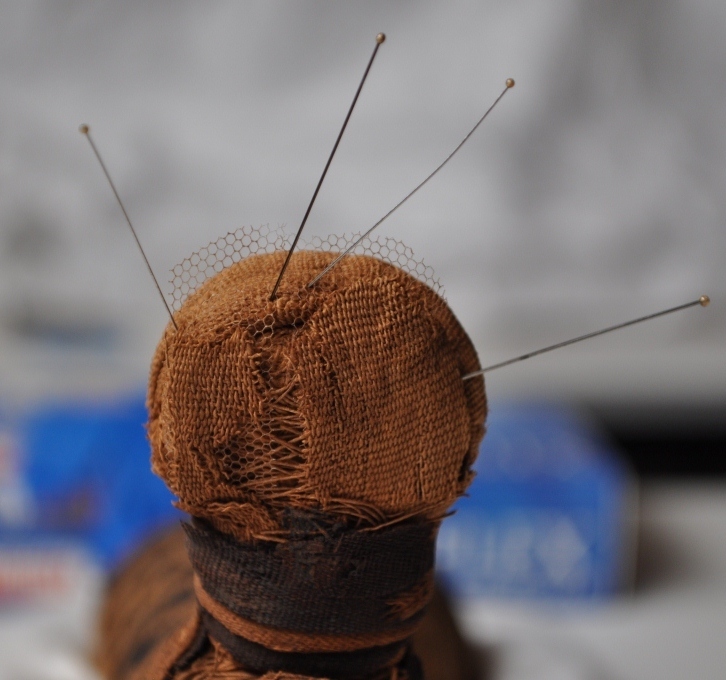 There is more fragile linen on other artifacts here in the lab as well, so this work is really helpful as I prepare to start these other treatments. prepare to start these other treatments.